Automatic liquid filling machine is a machine that was specially developed in order to fill high viscosity liquid products such as shampoo, lotions, oils (motor oil and cooking oil), etc. Liquid filling machine is majorely used for filling free flowing liquids. Liquid filling is automatic filling machine runs of volumetric filling principle. 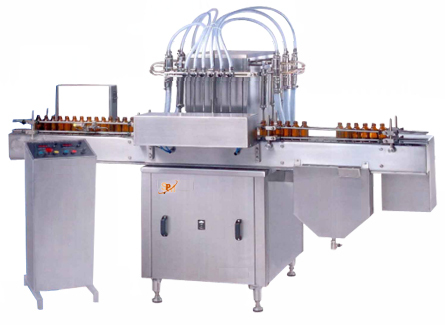 Liquid filling machine is widely used for milk filling, bottle filling, jar filling, container filling, oil filling,ointment filling,shampoo filling, juice filling, liquor filling, perfume filling, wine filling, can filling, food product filling. Liquid filling machine is also known as liquid dispensing machine,Liquid machine,Machine liquid,Liquid filling machine,Liquid filling,Bottle filling machine, bottle filling,Chemical filling machine, bottling equipment, water bottling equipment, packaging machine, water packing machine, liquid filler, liquid fillers, liquid filler machine, oil filling machine, automatic oil filling machine, volumetric filler, capsule filler, filling systems, liquid filling system, bottle sealing machine, sealing machine, liquid packaging, automatic liquid packaging, tube filling machine, tube filling machines, water pouch packing machine, automatic packaging machine. Filling by liquid filling machine is completely drip free and accurate in weight. Vineger filling, perfume filling are used in liquid filling machine . Suitable to fill 5ml-5Lit of Liquids in Bottles,Pouches etc.